The oral tradition is the time-honored way Native American cultures pass traditional values and beliefs from one generation to the next. The first storyteller figurine was created in 1963 by Helen Cordero of Cochiti Pueblo. Representing her grandfather’s way of telling stories by gathering everyone around him, Cordero was able to recreate a clay effigy to reflect his approach to storytelling. From there, the first storyteller figurine was born. Normally depicted as one person (or sometimes animal) painted or shaped with their mouth open, the storyteller may or may not be joined by a listener (a child or animal or both). These whimsical clay effigies beautifully convey reverence for the oral tradition and the significant role storytellers play in Native American culture. With over 200 Pueblo potters creating their own storytellers, there is great variety and meaning in the figurines you see today. 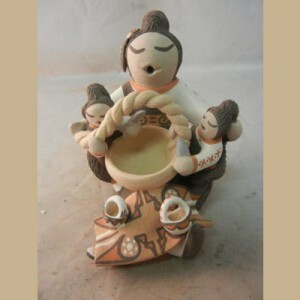 For example, some figurines are holding an object significant to that Pueblo—whether it is pottery, drums, food, or rugs. As these figurines continue to evolve and take on cultural elements unique to each Pueblo, they demonstrate the significance of honoring Native American culture through art. All of our storyteller figurines are purchased directly from Native American artists to ensure their authenticity. If you are interested in adding to your collection or looking to start one, we have a wide variety of Native American storyteller dolls that have unique stories to tell and come from different pueblos around New Mexico. Contact us directly and our personal shopper can help you understand the significance of each storyteller so you can find the best piece for your collection.